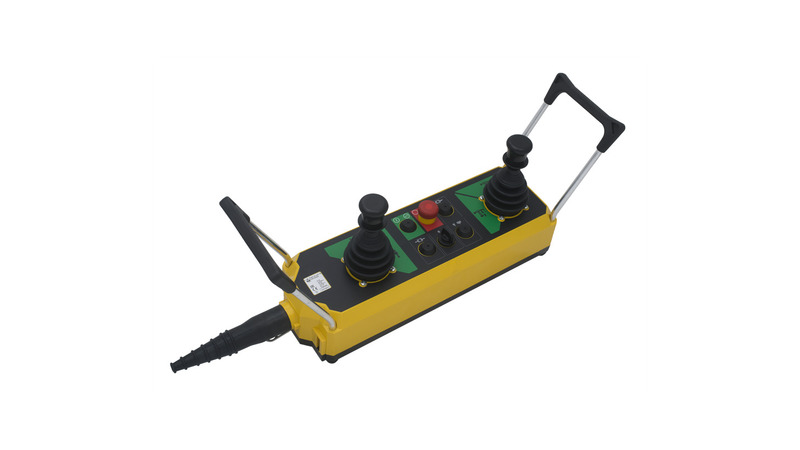 Romeo-PK joystick stations are control devices for all industrial machinery. They operate as auxiliary controllers of electrical motors through a power interface, such as a contactor or PLC. Designed for heavy duty use by qualified operators, Romeo-PK are aimed specifically for the industrial market. The emergency stop mushroom pushbutton complies with the EN 418 standard and it is equipped with positive opening NC switches. Romeo joysticks are available with up to 6 speeds, with or without potentiometer or encoder; a stepless version also available, with integrated analogical actuator, and with current, voltage or PWM outputs. Three different versions of Romeo are available: with free movement, with «dead man» safety device (with mechanical interlock with or without NO/NC contact), or with electrical interlock. The Romeo-PK joystick station can be supplied with different labels and colours. Materials and components are wear resistant and protect the equipment against water and dust.